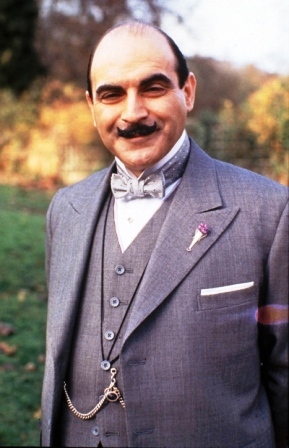 David Suchet as Agatha Christies Poirot, has long been my favourite version of the Belgian detective with a penchant for snazzy shoes and waxed moustaches. Isn't he dapper? I have also been a fan of the adorable boutonniere he wears with his impeccably tailored suits. For a while now I have been imagining making some of these from hollow handled cutlery. I finally snagged some hollow handled knives. Sometimes things are not what they appear to be for seemingly hollow handles may in fact be filled with plaster, rosin or cement! Needless to say that makes sawing through them rather challenging. The detail on some of the knives is really lovely. I think this shield shape will really suit my purposes as it has a kinda masculine look about it so it just might be the next one to get the chop! Ta da! After some sawing, filing and cleaning up here is my first little boutonniere. A substantial brooch pin on the back. Easier for manly fingers to manage perhaps? Pop a little damp sponge in there and the fresh flowers will stay fresh for ages. I just love this idea - do you think I can convince the blokes? LOVE it. They are just so cool! I can feel Don cringing as I write this.. I'd love to get inside your head when you go op shopping. Who else would have thought to turn knife handles into such treasures. Maybe you could add a chain and turn them into necklaces. Imagine wearing them filled will jasmine or freesias. never mind the blokes - the ladies will love them! Yes definitely can see the ladies loving them as GetSilvered says! That's just gorgeous Sue! I have some of those knives that I found years ago and loved them a lot. They have something rattling around inside the handles and I always thought they were supposed to be 'musical' but I think you may have cleared that up for me! I googled them but could never find an answer. Thanks folks - nice to know I am not completely off track sometimes things seem like a good idea to ME and then I discover not everyone is seeing the beauty ...!! Creative and great ideas to make decoration pleasing. Love reading your blog with inspirations. I love them, wouldn't they be a fabulous bloke wedding gift to wear on the day. My partner and I got engaged on the weekend and I think this would be great for him to wear on our wedding day! Going in the shop?